When it comes to your presentation technology choices, your decision says something about you. Do you know your material? What do you know about your audience? And, your choice of presentation technology is probably influenced by all three. What Technology Options Do You Have? Prezi or other PowerPoint alternatives? A well-practised presenter might choose to use PowerPoint or Keynote for their presentation. So they emphasise key points with some multimedia in their presentation’s slides. Their PowerPoint presentation is visually emphatic. And their slides are clear and consistent. Additionally, their organisation is ordered. It's well thought through. And, because of this, their presentation is more effective. It works better. A less-practised presenter, without a good knowledge of their material might use presentation software as a crutch. So, they use the software to help them get by with their presentation. PowerPoint might help to give them security as it hides the gaps in their work. That’s the theory anyway. However, most audiences can see through this. Because you can't fool your audience this easily. But if you know your audience really well, it could inspire you to break the bounds of PowerPoint or Keynote. It might possibly encourage you to try out newer presentation manager alternatives such as Prezi. There are some really good alternatives. 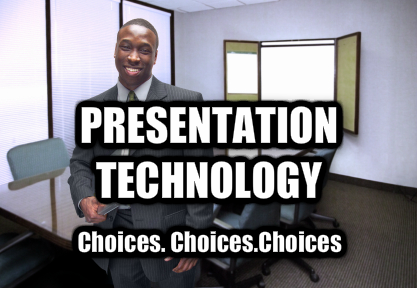 Therefore, your choice of presentation technology reflects your earlier preparation. And, of course, it reflects your research. Because when you know your material and your audience, you will have more options for an effective presentation. As a result, and more importantly, you will have more control over the presentation technology you choose to use. You can learn more presentation skills and techniques on a public presentation training course. Organised to a regular schedule, so there’s something for everyone. Or, when the time is right and you want your whole team to train together, then a corporate training course might be the best formula. Please don't hesitate to get in touch for presentation course advice.